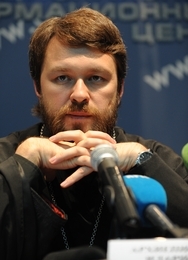 In an interview with Interfax-Religion the chairman of the Department for External Church Relations Metropolitan Hilarion of Volokolamsk spoke of the coming election of the Primate of the Ukrainian Orthodox Church, of the steps necessary to resolve the serious political situation in south-east Ukraine, and commented on the decision by the General Synod of the Church of England to ordain women as bishops. - Your Eminence, you represented His Holiness Patriarch Kirill at the funeral of Metropolitan Vladimir of Kiev and All Ukraine. At the beginning of May at passport control in Dnepropetrovsk you were told that you had been denied entry into Ukrainian territory. Did you go through this time without any problems? - This time I crossed the Ukrainian border without obstacles. Petr Alexeyevich Poroshenko saw to this personally. - Could you please share your impressions of your visit to Kiev? - The funeral of His Beatitude Metropolitan Vladimir, for which practically all of the episcopate of the Ukrainian Orthodox Church had gathered, took place in a very solemn atmosphere in the Monastery of the Caves in Kiev. Together with the Liturgy it lasted almost seven hours. A great number of people filled the monastery courtyard, everything took place in the open air. This made a majestic impression, which was completely befitting the importance of the man we were accompanying on his final journey. His Beatitude Metropolitan Vladimir was a historical person, an outstanding man. He became head of the Ukrainian Orthodox Church at a very difficult turning point for her when within the bosom of the Church a schism had arisen and when the former metropolitan of Kiev Philaret Denisenko attempted to tear the Ukrainian Church from the bosom of the Moscow Patriarchate. The bishops of the Ukrainian Church grouped together and did not allow this to happen. Here we should note merit of the ever-memorable Metropolitan Nikodim of Kharkov who convoked a Council in Kharkov but himself had no claims to become the head of the Ukrainian Orthodox Church. The Council then elected Vladyka Vladimir metropolitan of Kiev, who at that time was carrying out his ministry beyond the Ukraine as metropolitan of Rostov. He viewed this ministry not as an honour but as a cross, and he bore it with dignity for more than twenty years. Throughout this time he was accorded the love and recognition of all those who lived in the Ukraine. He was respected not only by the Orthodox faithful, but also by representatives of other Christian confessions. And even for the schismatics and non-church people he was an authority, he was listened to, and his opinion always meant something. Metropolitan Vladimir's image has become an exceptionally positive part of Ukrainian history. His name is tied in many ways to the revival of the Church in the Ukraine that embraces all her regions - both east and west, north and south. He played an important role, was always open to dialogue, but assumed the resolute and principled position that the Ukrainian Orthodox Church is an integral part of the Moscow Patriarchate: it is what we have received thanks to our history, it is the unity which cannot and must not be destroyed by any political circumstances, nor by any boundaries that have arisen. We know that state borders have very often changed throughout history. Yet the unity of the Russian Orthodox Church remains an unshakeable value which no one can undermine. And if political borders arise, they do not concern the Church. But if a schism occurs, we speak openly of the fact that it is not the Church that disintegrates into separate parts, but that certain people or groups of people have left the Church in order to set up an alternative structure. Metropolitan Vladimir had a very precise ecclesiological awareness. Among other things, he was a theologian, the author of a whole number of scholarly works, and for many years he was rector of the Moscow Theological Academy. This firm theological foundation which he received in the theological schools and which he developed throughout his life thanks to independent scholarly labours also helped him in his ministry and in his firm stance for the unity of the Church. - On the 13th of August there will be an Episcopal Council of the Ukrainian Orthodox Church which will elect her new Primate. In your opinion, how is it possible to avoid mistakes, what are the chances that the choice will be made in favour of the most worthy candidate? - I am convinced that the bishops of the Ukrainian Orthodox Church will elect the right person worthy of carrying out this ministry. And as it was at the Council of Kharkov in 1992, so it will be now. It would be quite incorrect and unethical on my part to express an opinion on any of the possible candidates, to give any evaluations or warnings on mistakes. I believe that there will be no mistakes and that a worthy candidate will be elected. Let us also not forget that the Ukrainian Orthodox Church within the Moscow Patriarchate is self-governing, and therefore this should be the free choice of her bishops, that there should be no external interference. And it is also very important that no political influences are brought to bear on this process. It ought to be a free, unhindered choice through a secret ballot in which each bishop takes part following only the voice of his conscience, and not under pressure from politicians or whatever secular structures. - In your opinion, how strong today is the position of the supporters of the autocephaly of the Ukrainian Orthodox Church among her bishops? - I think that such people in the Ukrainian Church make up a small handful of individuals. And I think that in these cases conciliar reason always triumphs. Each bishop, each member of the Church may have his own personal opinion, his own vision of history. But for the Church what is important is not that a particular person expresses his private opinion but what the Church is guided by when her conciliar voice is heard. And the conciliar voice of the Church is not only the totality of the voices of the bishops, clerics and laity. It is also the action of the Holy Spirit, who manifests himself in decisions such as the historical decision of the Council of Kharkov in 1992, when none other than His Beatitude Metropolitan Vladimir was elected to the see of Kiev. - Blood continues to be spilt in the south-east of the Ukraine. What would appear to you to be the best solution for an outcome to this situation? - I believe that in the first instance it is essential as quickly as possible to obtain a ceasefire, because each day that carries away peoples' lives is a day lost for the peace process, for our future. Each new death resounds with pain in the hearts of many, both Ukrainians and Russians. I would not at all like to see on the post-Soviet expanse a repetition of the tragedy that is now playing out in the Middle East, aided by external forces which have decided to interfere in the situation in order to install order and have turned the Middle East into a place where arbitrariness, terrorism and chaos reign, where people are decapitated, where brother has risen up against brother, and where the various ethnic and religious groups, who have lived together for centuries, have risen up against each other. We must not allow that something of the sort should occur in our countries. And here of course the Church has a very important role to play: it is a reconciliatory role, the role of intercessor before the powers that be. Our Ukrainian brothers have now found themselves in a very complicated situation. They must conduct a dialogue with the authorities, but this dialogue must not be of a political nature: it has to be motivated by the striving to preserve peoples' lives and to end the bloodshed as quickly as possible. - In conclusion, allow me to touch upon a topic that has nothing to do with the Ukraine. The General Synod of the Church of England has by a majority approved the decision to ordain women as bishops. What have you to say on this decision? - As you know, the Orthodox Church takes a negative view of the so called women's priesthood and women's episcopate. We see in this process the rejection of the Anglican Church and a whole number of Protestant denominations of the ancient order of the Church and the following of contemporary liberal tendencies. We regret that these decisions are being taken. It is the internal affair of these confessions, there is no way we can interfere, but we can express our opinion. Of course, such steps do not bring us closer to the unity which is still spoken of at inter-Christian meetings as the goal of such meetings. They only further alienate us. At the time when women's priesthood was introduced, the Orthodox Churches reacted negatively to this, yet nevertheless dialogue, including theological dialogue, with a number of Protestant churches continued. For example, our Church continues to hold dialogue with the Evangelical Lutheran Churches of Germany and Finland, we maintain relations with the Church of England, and I hope that they will be maintained in the future. But we have to continually re-format these relations because if before we could discuss theological, ecclesiological and moral problems, now it has become all the more difficult as we are moving further and further apart and the field of co-operation is constantly becoming more narrow. We have practically removed theological and ecclesiological issues from the agenda in dialogue with the Protestant confessions. We are still capable of discussing together moral issues, but in this field there are greater and greater differences between us. The area for dialogue is becoming ever more narrow - it is the fault of our partners, and we state this with great regret. When I was still bishop of Vienna and Austria I participated as an observer on behalf of the Russian Church in the Lambeth Conference - the conference of Anglican bishops which gathers once every ten years. At one of the round tables within the framework of the conference I was asked the question: 'Why do you speak out against the women's episcopate, if you have managed to 'swallow' the female priesthood? Is there any principle difference?' Up until then I had never thought about this. But when the question was put so directly, I answered that there is a principle difference because the succession of ecclesiastical authority passes through the direct chain of the ordination of bishops, and this chain goes back directly to the apostles. Priests do not have apostolic succession: they receive ordination from a bishop. If from our point of view we say that a particular bishop incorrectly ordained someone, then we can at least interpret this as a mistaken decision of the bishop but does not impinge on the episcopate as such. But if within the episcopate itself there occur violations which we consider unacceptable, then for us even the theoretical possibility of the recognition of apostolic succession in this episcopate disappears. Indeed, this was one of the topics of the Orthodox-Anglican dialogue as far back as the nineteenth century when the Anglicans wanted to prove that they enjoyed apostolic succession. In the hypothetical instance of our Churches coming together this issue could arise again, but now it can no longer arise as the presence of women in the episcopate closes the door for any discussion of the topic of apostolic succession in the Anglican episcopate. This is what for us is the essential difference between the female priesthood and the female episcopate. And that is why the introduction of female bishops narrows further not only the possibility of coming together, but also the possibility of dialogue. Nonetheless, we will continue this dialogue in the hope that our voice will be heard.